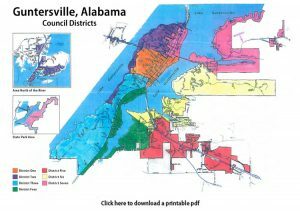 The City of Guntersville holds regular municipal elections to elect a Mayor and Council on the fourth Tuesday in August every four years. Runoff elections are held on the sixth Tuesday following a regular election, if required. Mayor and Council elected during regular elections shall assume the duties on the first Monday in November. The City Clerk is responsible for coordinating municipal elections. The next municipal election year is 2020. The polling location for municipal and other elections for all residence inside the Guntersville City limits is the Guntersville Recreation Center, 1500 Sunset Drive, Guntersville, AL 35976. To request an Absentee Ballot during an election, contact the City Clerk’s office at (256) 571-7560. To inquire about qualifying as a candidate for a municipal election, contact the City Clerk’s Office at (256) 571-7560.